Firefox browser, one of the best in the market has now launched the browser for the android operating system, keeping the technology same and optimizing it for usage in the mobiles. It is still in beta version, and the first impression says it’s not really well made and is pretty heavy for a mobile operating system. It has come in with a few features that can keep the other android browsers behind this, but still everything is cluttery and doesn’t work very well, after a few tests of using the add-ons, and opening multiple tabs. It not just ate up a lot of memory but also went dead when I tried opening 4 tabs at once, whereas the default android browser in Samsung Galaxy S works far better and faster. Sync – Its one of the best things, which keeps your firefox browser history, bookmarks, open tabs, saved passwords and the form data all synced between the computer and the mobile device browser. One of them most handy option when you are switching between the mobiles, or want to have the same tabs on the mobile which you had on the laptop while browsing. It works pretty well, and the passwords were not needed to type always, as the ones stored on laptop were available on the mobile browser after the sync. Awesome Bar that you see on the web browser in computers is not the same here. It isn’t that perfect, as once your sync the data between both the platforms, the speed of searching through awesome bar and history gets reduced. Add-ons are available for download and installation, and they work pretty well, just like what you see on the web browsers. 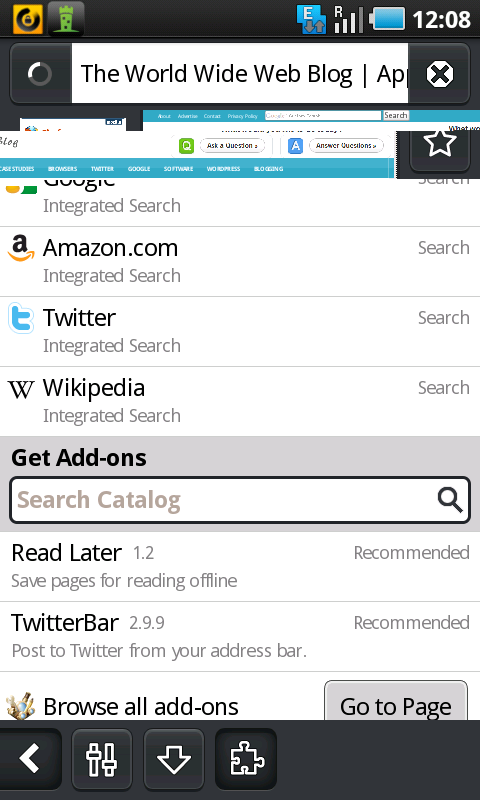 The manager section has a the list of add-ons that you have downloaded, and those which you can download and use to enhance the browsing experience. I tried downloading the TwitterBar add-on for the firefox android, which worked pretty fine and tweeting from the awesome bar was possible. The touch user-interface was quite good but still needs some touch-ups as the dragging has a threshold, and if crossed the browser goes dead. The screen is well spread, with the main window occupying whole of it, but swiping the screen left and right would expose the sections of multiple tabs and browser control and tools. Many functions are given on the side sections, which are easy to access and use, and a single touch can help bookmark a website. The browser has its own password manager which helps you manage, add or remove saved passwords and later can sync them with the firefox browser in your computer. 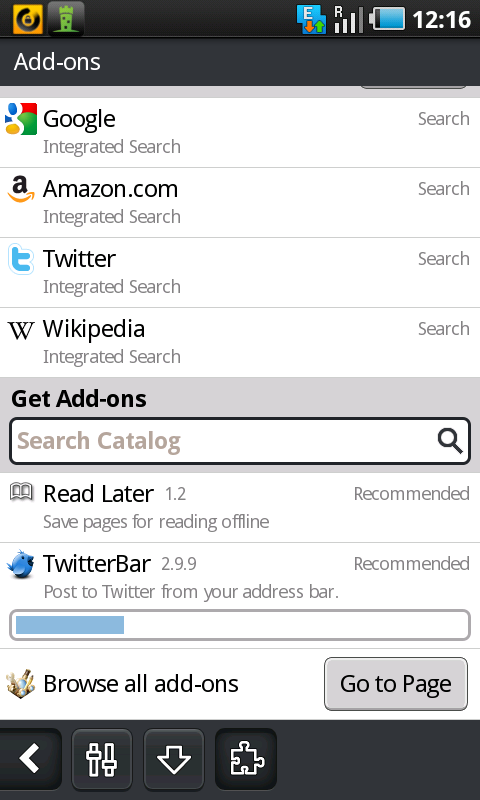 Long touch on a link gives you options to bookmark, or share it via twitter, google reader, facebook etc. As Mozilla says, it has included 2 technologies named Electrolysis and Layers, which have enhanced the responsiveness of the browser, and the actions like zooming in and out have been improved, but unlike the default browser, I had to wait until the entire page was loaded, and only then the zooming in displayed good graphics, till then everything was cluttered and unclear. The Pinch-to-zoom works pretty well though. Performance – It isn’t really slow as a mobile browser, and can be compared to the other browsers for android, but the Firefox android beta would start acting weird once the sync is done with the browser on laptop platform which had a big database of history, passwords, user form data etc. 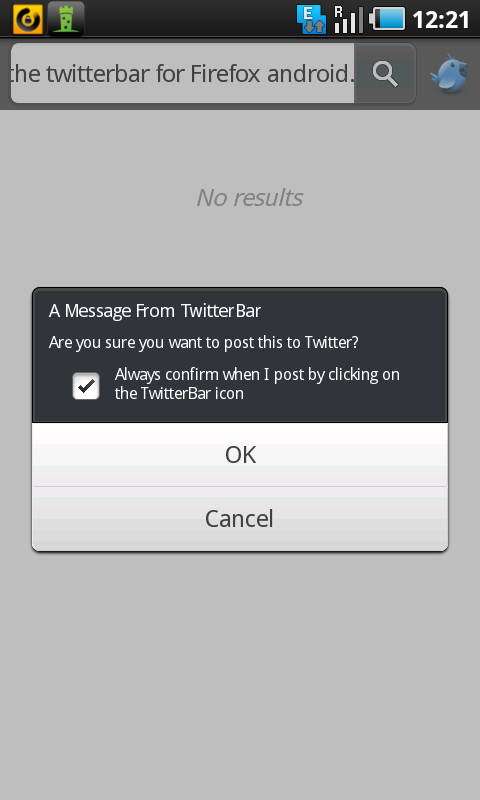 Limiting the browser syncing to passwords etc. is good enough. While opening 4 tabs at once, and downloading an add-on I checked the task manager, where the Firefox was using 50MB of RAM, and 7% memory which wasn’t constant. Still, comparing the same with the default android browser, its pretty high. 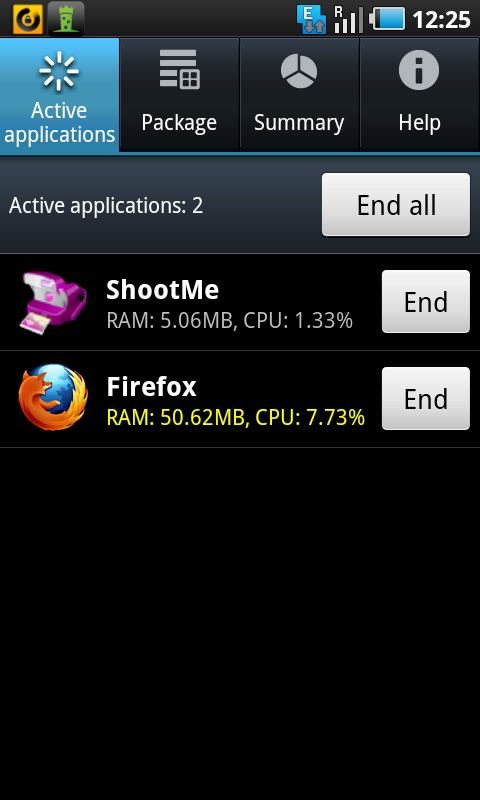 The same functions performed by the default android browser used just 30MB RAM and 4-6% memory. 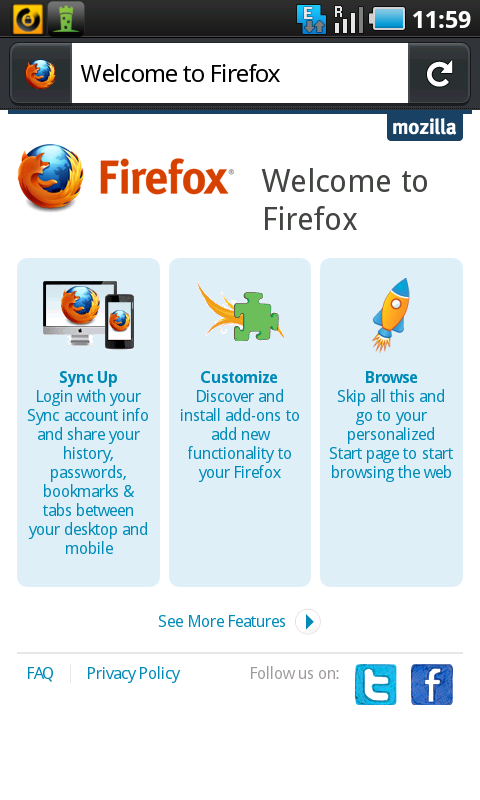 But the default browser doesn’t provide the add-ons and sync functionality as Firefox does, and that would an advantage of using firefox, which may risen the user browsing experience. 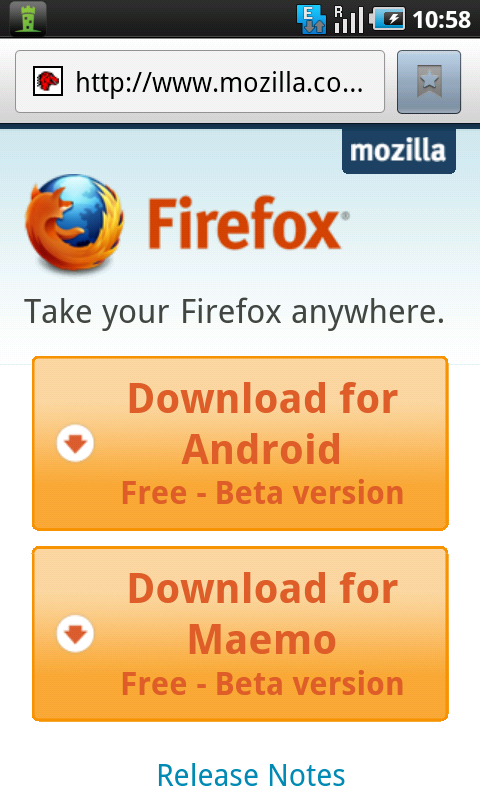 You can download the Firefox for Android beta from here. 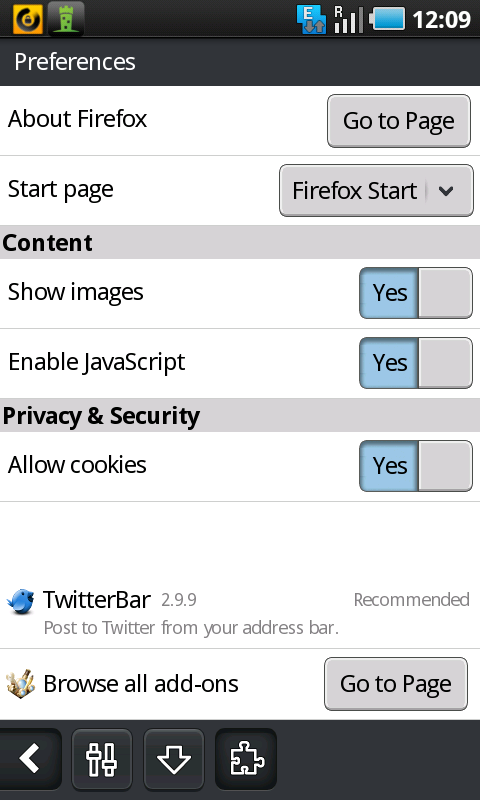 Firefox browser for mobiles has made no impact on the international market as its features are quite annoying , while in using it in the android user want to surf the web pages as fast as possible and as all know it loads the web pages very slow and this made it to leave this application and some other are also there like the memory consumption which is making an negative impact in the users. 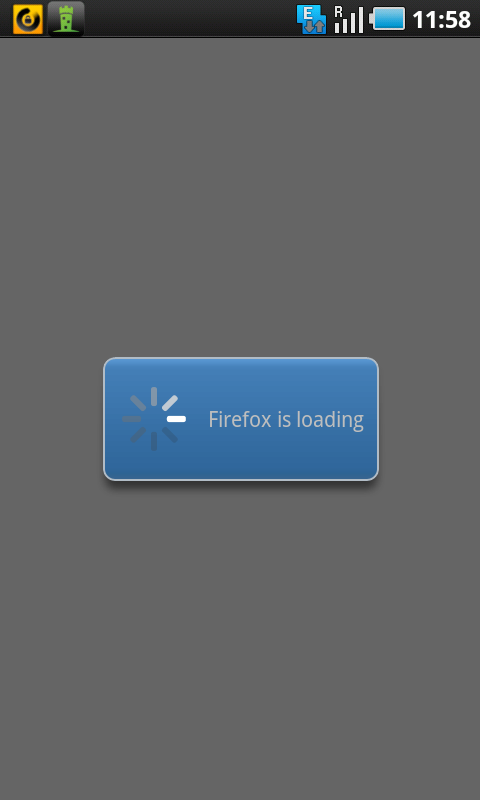 i can't download firefox, my phone is samsung galaxy fit.